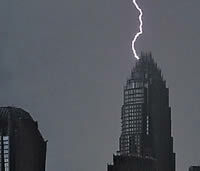 The rain filled thunder and lightning storm season is almost upon us in the Charlotte area. Along with the bad weather comes the inevitable homeowner insurance claims for lightning strikes on air conditioners and damaged home HVAC systems. In fact, lightning is so bad in our area that North Carolina is ranked #5 overall, for damages or death due to a lightning strike! In this Charlotte HVAC article, we want to take a quick look at a few tips for speeding up the process of getting your home hvac system replaced after it’s been damaged by a weather event like lightning. This article is applicable to people whose air conditioner hit by lightning or their heat pump or package unit was hit by lightning. 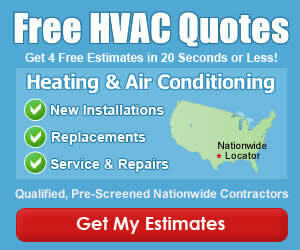 You can expect to wait a day or longer for an adjuster to get out and inspect the damages to your HVAC system. When they do, they may try to give you a check right there on the spot, to repair or replace the unit. We recommend you never take the check from them during the initial visit, since the insurance company position is to save themselves as much as possible! After all, if they give you a check for $1500 and the replacement cost $3000, what good is that to you? Get Multiple Repair and Replacement Estimates! The most important thing to get done after lightning ruins your home hvac system, is to make sure you get multiple cost estimates for the repair or replacement. The insurance company may only pay to have the unit brought back into working order if its less than 8 years old, so knowing what different companies may charge to compare it with the insurance company claim is important. A new company in the Charlotte market, the HVAC Investigators, can also help to bridge the gap between yourself, the insurance company and your Charlotte HVAC repair company. According to their website, HVAC Investigators sends a trained and qualified technician to your home to thoroughly assess the damages to your system. They will then prepare a complete report for the insurance company and let them know whether the system can be repaired, or must be replaced. This type of service is mutually beneficial to both yourself and the insurance company since claims can be resolved very quickly, and you can get your system repaired or replaced in the quickest manner. Have you ever had to file an insurance claim on HVAC equipment in the Charlotte area, or used the services of HVAC Investigators, please let us know how the process worked for you in the comments section below. One of our fencepoles was hit by lightning last year and it cooked the air conditioner condensing unit that was within 3 feet. You could see the black line in burned grass and the adjuster tried telling us it was unrelated. haha. My word of wisdom is that you keep great records and make sure you get the adjuster out within a few days of the storm. They won’t want to replace the whole system and they will try to force you to have it fixed instead. If its more than 10 years old, forget repairing it and force them to replace! What electrical system replacements are required for a homeowner who’s house has been struck by lightening that caused a fire in the main artery of house wiring? It is my understanding that such a strike weakens or destroys wiring everywhere in the home, from the doorbell to the air conditioner, and everything in between. If this is really the case, does the insurance company require a full replacement of everything electrical before the house can be insured again? This information is not to be used for any kind of claim settlement, only the proper repair of a house so damaged by lightening and the fire that resulted.